It seems like every good action-adventure console game is getting a puzzle remake for mobile these days. We've already seen Hitman GO and Tomb Raider GO (both solid games) and now Nathan Drake is getting into the mix with Uncharted: Fortune Hunet, a free-to-play game for mobile devices. And, it's pretty fun too. The game features over 200 puzzles where Nathan Drake has to gather up all the treasure he loves so much, though this mobile version of Drake appears to have given up his mass murdering days. You'll have to find your way around various levels, avoiding traps, and flipping switches in the right order to get you through. It even has some nice touches for fans of the console games, like Drake taking notes in his notebook to help remember what switches do what, as well as an ongoing chat with Sully. Also for those who like the console game, there is integration with Uncharted 4, so you can unlock things in Uncharted 4 by playing this and unlock things here if you play Uncharted 4. There are also the usual coins to collect to buy various costume changes as well as keys used to unlock treasure packs that give you extra goodies. The game is free-to-play, and in some early testing it doesn't seem too hard to get by without paying, which is nice. 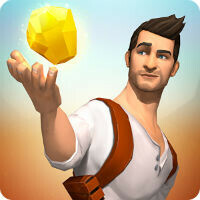 Uncharted: Fortune Hunter is available now for Android and iOS. Who have played The other 3? Those games were must haves for PS3 owners. And for PS4 owners who never owned a PS3, the Nathan Drake collection is a great fun for a great price. Naughty Dog is undoubtedly the best developer for Sony exclusive games. Especially their masterpiece The Last of Us. I installed it, but I wonder why it needed permission to location, contacts and phone.